Providing skills development in a non-traditional format can prove to be very popular, especially when students can take a full and active role in their own learning. Articulate is a five-day communication skills programme, in collaboration with Articulacy. Our shared mission is simple: inspire young people to become confident and articulate individuals, in their school lives and beyond. Working with target schools, we identify thirteen year 9 pupils via a three-phase targeting process, conducted by the school and the NSSW evaluation team. Students learn essential skills of speaking, listening, discussion and debate. Through an energetic mix of challenging games and practical sessions, we increase confidence and improve soft skills, helping learners overcome barriers of low self-esteem and anxiety, and grow their academic potential. Watch: See what teachers and pupils have to say about the Articulate programme. 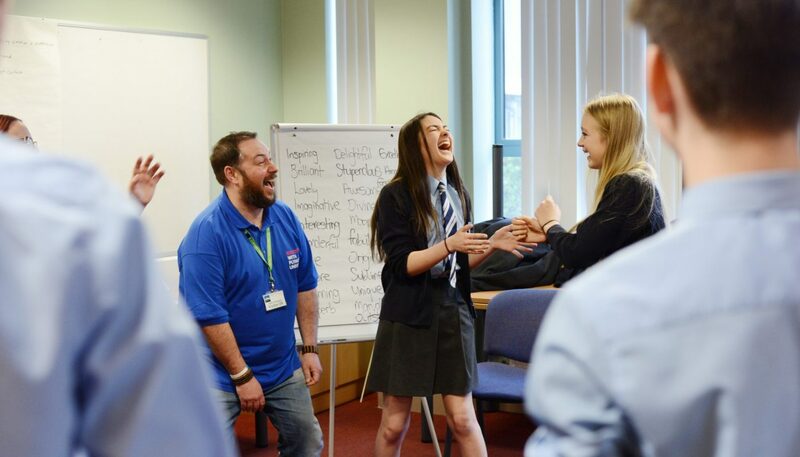 Articulate workshops are designed to nurture effective communication skills, build confidence, encourage debate and raise aspirations – whilst introducing higher education. Students enjoy a massive sense of achievement, and develop presentation and speaking skills in an interactive and fun environment, whilst supporting KS3 targets. The programme culminates in an accredited English Speaking Board qualification. Prioritising regular one-to-one tuition and positive reinforcement, we encourage active engagement in learning. The presence of our HE student ambassadors also provides additional help and support from university role models. The motivational teacher-student and peer relationships that ensue revolutionise the classroom, creating a supportive space for pupils to realise their full potential. * Please note these activities do not result in an external exam or qualification. To download a digital copy of our Articulate flyer click here. Explore a variety of in-school packages at articulacy.co.uk or contact the team at Next Steps South West to discuss your options.